The official designation for this planetary nebula is PK205+14.1. 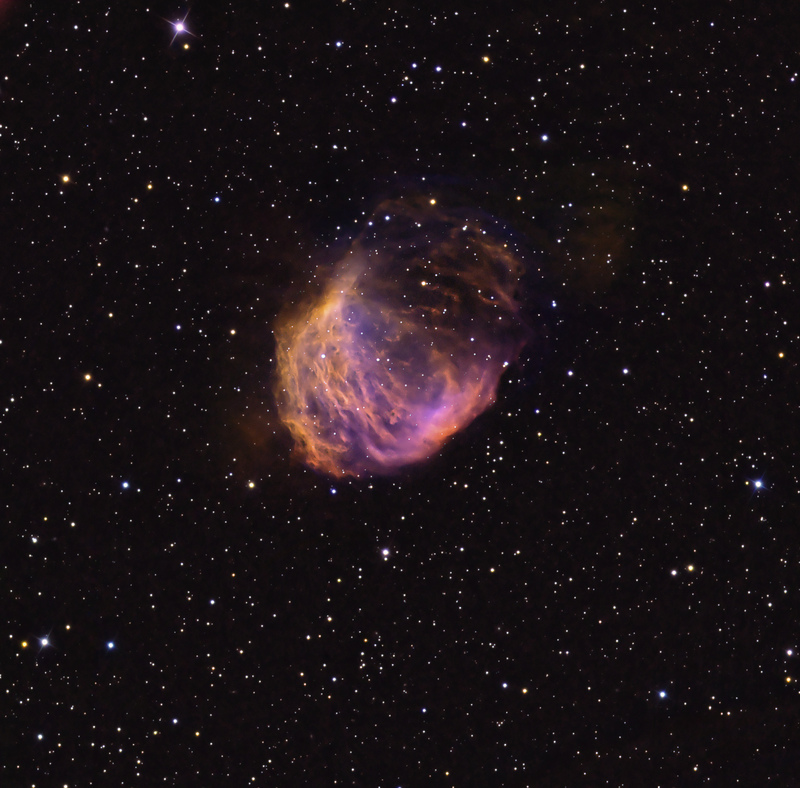 It is also listed as Abell 21 and Sharpless 2-274. Although initially thought to be a supernova remnant, the Medusa is a large PN in Gemini about 1,500 light years distant and 4 light years across. It is considered to be an old planetary nebula. North is to the upper left. The brighter portion toward the SE gives it a crescent moon appearance. The high contrast of the narrowband filters brings out additional, faint shock front structures toward the NW, showing a more oval shape to the object. There are faint areas of nebulosity outside the main structure. These data were taken with Astrodon 3nm FWHM H-a, OIII and NII narrowband filters. A 3 nm bandwidth begins to separate the (spectrally) adjacent H-a and NII emission lines. The colors were assigned similar to the Hubble narrowband palette in order of increasing wavelength, with B = OIII, G = H-a and R = NII. RGB data were added for star colors. My narrowband image of M27 was processed similarly with NII.